Academy City forces land in Avignon as Touma and Itsuwa fight Terra for control of a vital Vatican document. #03 - "The Document of C"
This was an action episode, so a lot of the time was spent with the characters yapping at each other between short bursts of violence as the audience and the protagonists tried to figure out how the villain's power works. Tsuchimikado had his moment with the powered suits with the buggy AI, but the focus was on Touma and Terra of the Left. Itsuwa had figured how Terra's Precedence invocation works, but she got knocked out just before she could tell Touma. He got it eventually, and we got to see his signature right hand punch. A couple of times, even. There were some important revelations for the larger story, which comes back around to how much Touma was made to forget so that Index was free to live in Academy City. 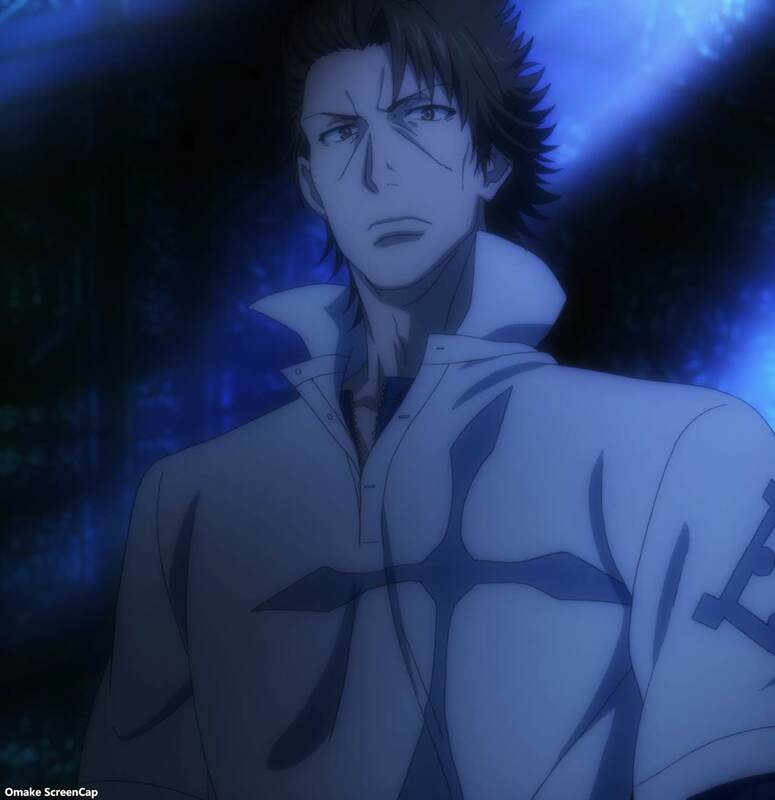 All the things he did during his time he got Imagine Breaker and before his memory of that time was erased (or whatever...), are why his friends treat him so well and why Mikoto is so frustrated with her feelings for him. She just learned he has amnesia after listening to his talk with Terra over his phone, so maybe she'll cut him some slack the next she sees him. Better yet, this Terra guy knew a lot about Touma's "recovered" power. Of course he was interrupted by a wall of fire before he could tell him anything, even if it was going to be a snarky hint that hid the key information. The part that ties Touma to these Right Seat of God guys was revealed by the captured Roman Orthodoxy agents - their ultimate agenda is not to be seated at the right hand of God like the archangels (Jesus changed this anyway to Peter and his successors, so I don't know why the Pope is supporting their cause), but to surpass God. To be above God. In Japanese, Above God is 神上 (kamijou), which just so happens to be a homonym for Touma's name Kamijou (上条), but these kana can be read as "previous article" or "above section." That's a huge hmm moment for this story. Okay, so the kids have to figure out how Terra's power works. That powder is flour, meant to represent the Body of Christ. Jesus had to change the precedence of material objects so they would be allowed to kill God. All very logical and heretical. Tsuchimikado has a plan, but he's a big talker. Here come those armored power suits from the weapon show. I don't think beautiful lady cops are going to pop out of them. They're arresting the rioters. Ha. Mikoto is mad that Touma called her instead of replying to her text first. These things have an order to them, Mr. Kamijou. Tsuchimikado knows how to handle the power suits, so Itsuwa and Touma have to get the Document of C and deal with Terra. Oh good. He came to them. Hey, Accelerator is in that plane. They're quarantining the whole city of Avignon with these "Earth Blades." Looks like a wall of fire to me. Terra knows about Imagine Breaker. He says Touma should be able to do so much more with it. Itsuwa figured out Terra's power, but she got knocked out. Not helpful. Ah. Now Touma got it. Time to distract and get the timing right for his right-handed punch. And right before Terra tells Touma anything, a big wall of flame burns him up. Of course. Hoh. Lydia says The Right Seat of God groups wants to become superior to God. Above God (Kami jou). Hey! That sounds just like Touma's name! Huh? Terra wasn't dead? Did he fly back to the Vatican using those power lines from Avignon? Oh. He's dead now. This Acqua guy didn't like him killing innocent people, non-believers or no. And that's the actual Pope? Why is he supporting this stuff if the agents in the field are not? So, let's see. We got the four elements of earth, wind, fire, and water. Terra was the Left, Vento was the Front, Fiamme was the Right, and Acqua is the Rear. God must be in the center. So, the next villain will be this Acqua guy going to Japan. But I suppose we need to take the story on a different tangent before bringing him back in. Time for some Railgun? I saw the last Misaka clone looking all cute.